Welcome to the Oregon butterflies section. Size and a diverse landscape provide Oregon with plenty of different butterfly habitat. It easily translates in a diverse group of butterflies. 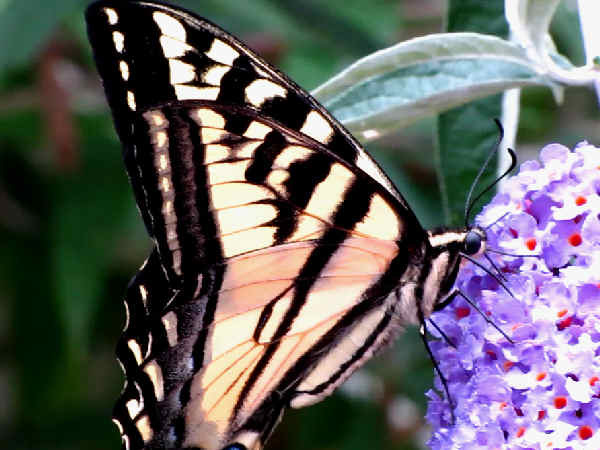 Visitors looking for butterflies would do well to start at the coast, the coastal range mountains, the Cascades and areas East of the Cascades. 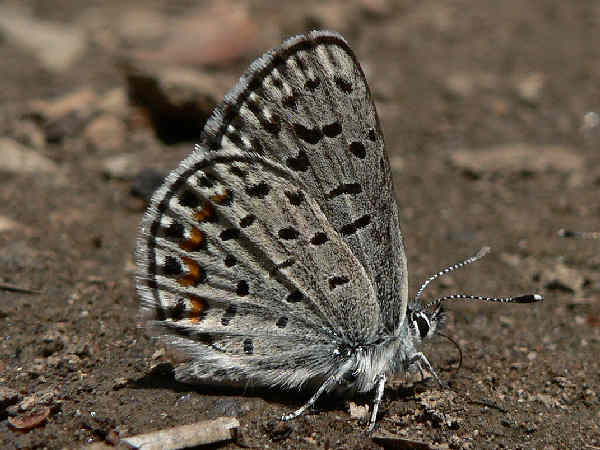 The Cascade-Siskiyou National Monument is the southern part of the state is an especially good butterfly hot spot. The story of Oregon butterflies is not always sunshine. Two species, The Taylor’s Checkerspot and the Fender’s Blue are listed as endangered. 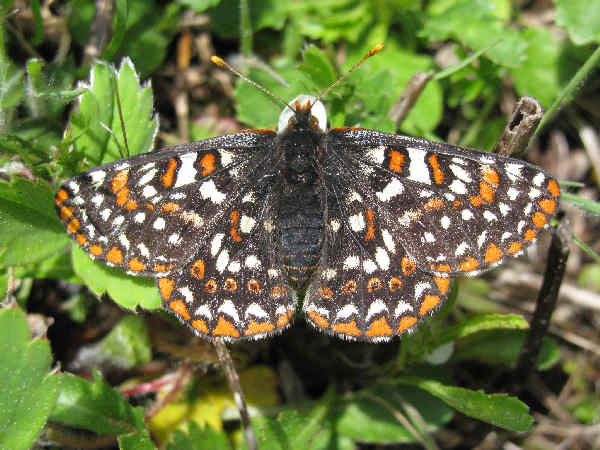 Taylor’s Checkerspot is a very colorful butterfly and a subspecies of the Edith Checkerspot. Habitat destruction accounts for most of the population decline. Currently conservation organizations such as the Xerces Society are working on a two-pronged approach to help the populations: habitat rehabilitation and captive rearing. 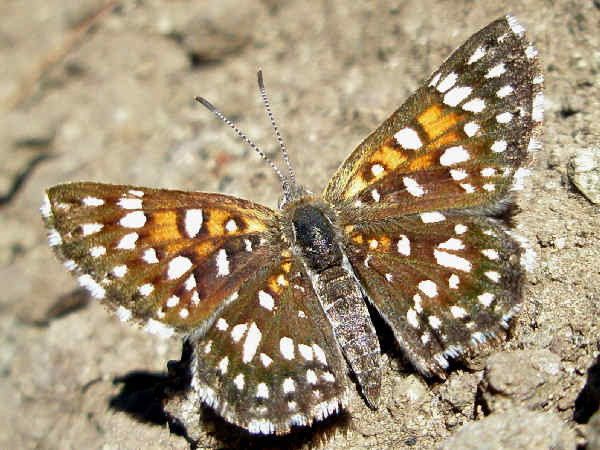 A combined total of 4,901 checkerspots were counted across six sites (R76, R50, SCS, PCM, GHP and TA7S) during distance sampling surveys in 2014, a 60 percent increase compared to the 2013 count. Long-term monitoring and population goals developed in fall 2012 were used to assess progress at R50. Based on those criteria, that site far exceeded the target of 250 adults on a single day in both 2012 and 2013, based solely on natural reproduction. Increased population numbers suggest that the Taylor’s Checkerspot might be around to enjoy the sunshine into the future. Visitors looking for butterfly identification help can press the green butterfly button for more information. Oregon butterflies consist of a variety of species in the family Pieridae. Most people know them as the the butterflies with white wings and yellow wings. Many of the white butterflies have a regional range in the state. The picture shows an Orangetip butterfly, one of the white wing butterflies with a bit of sparkle added to the wings. They are fairy common at all elevations, as long as the larval host plant, mustards, is present. 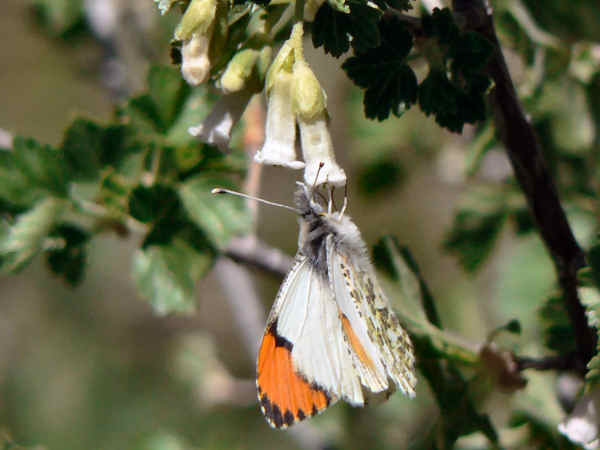 Of course, spring gets to the mountains later than it arrives in the valley so visitors can catch Orangetips in May in the valleys through July in the mountains. Oregon is also a great place for visitors to catch up on a few of the Yellow butterflies for their checklist. 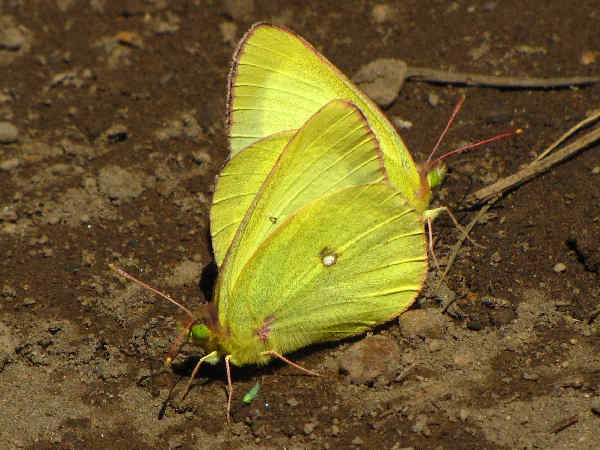 With the exception of perhaps the Western Sulphur, pictured, the other sulphurs have a presence from coast to coast. Catch the Western Sulphurs in the mountains. Spring, summer and fall, there is always a healthy diversity of Oregon butterflies in the gossamer-wing category. 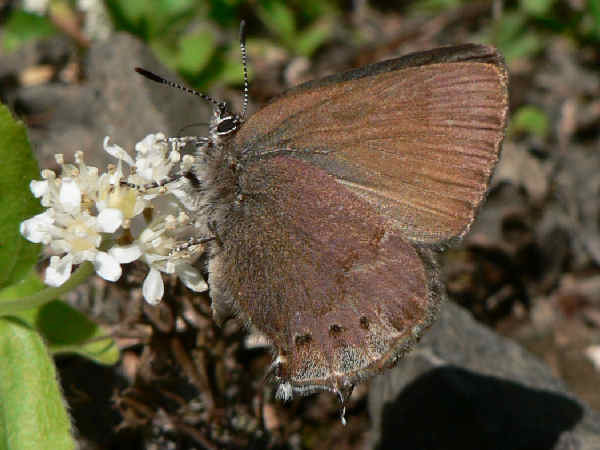 Like many Western states, Oregon does have nice balance of coppers, blues an hairstreaks. Traveling east and west of the Cascade Mountains is necessary for seeing and photographing the entire bunch. 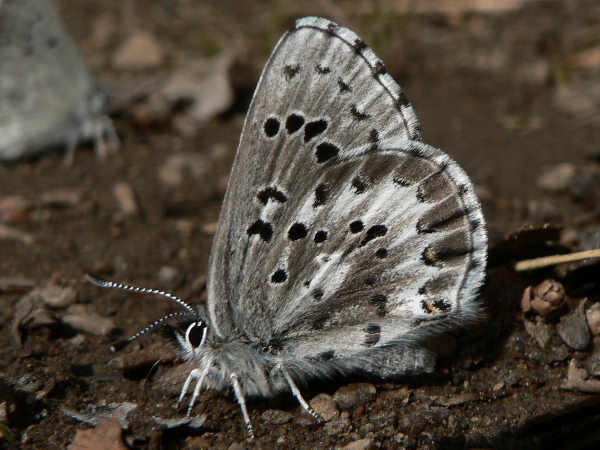 The picture shows an Arrowhead blue, they are often found in particular mountain locations. Hairstreak butterflies are also abundant throughout Oregon. With the exception of the Gray Hairstreak, most have a regional habitat. The Cadcade Mountains often, but not always, serves as a primary regional dividing line. The picture shows a Nelson’s Hairstreak. Cedar trees serve as the larval host plant for the species and therefore it’s distributed across Oregon where ever the trees grow. 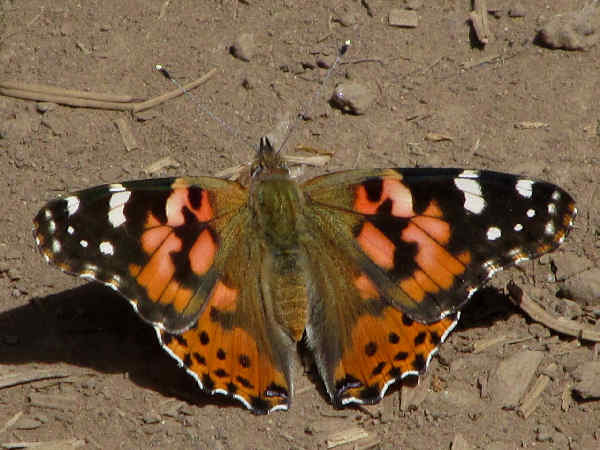 The list shows that the types of butterflies in Oregon belonging to the Brush footed family tend to fall into a few common genera such as Fritillaries, Checkerspots, Commas and Crescents. As tourists travel up and down the coast, or from west to east across the mountains, it’s good to remember that fact. There’s always a new butterfly species around the corner or at the next rest stop. Oregon hosts a variety of Swallowtail species, including two Parnassian species. The official state insect is the Oregon Swallowtail. Pale Swallowtails look very similar to western Tiger Swallowtails. The difference is a more pale looking set of yellow wings.